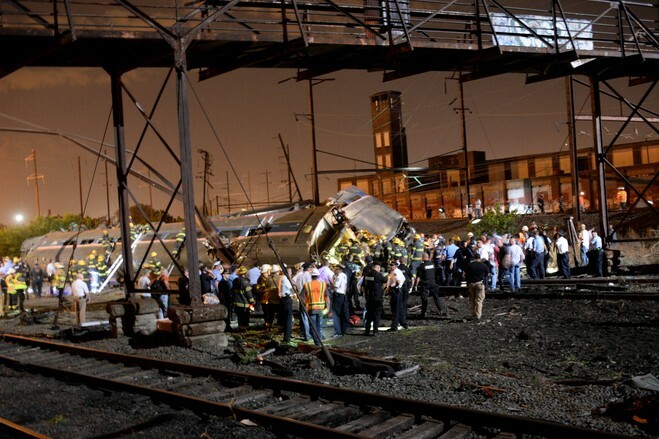 It seems that the recent train crash in Philadelphia was associated with poor infrastructure since the crash occurred where “there is a curve” in the track. The problems with infrastructure is something I am familiar with and have discussed it a few times in the past. After the Argentine 2001 economic collapse, the lack of money for investment and infrastructure was obvious. As months went by potholes popped all over the country, buildings started to look more ran down and yes, trains became more dangerous. In 2012, an accident in the station of Once, Buenos Aires, ended up with 52 dead. 70,000 bridges in America -- one out of every nine -- is now considered to be structurally deficient. 1) The train wreck did not happen because "America's infrastructure is falling apart" -- the track where the accident occurred had been inspected hours before the wreck and found in good condition. 2) The train wreck occurred because the engineer in charge of the train drove it into a 50 mile per hour curve at a speed of 106 mph and threw on the emergency brake at the last second, cutting the speed to only 102 mph. 3) And when asked by the police what happened, the engineer refused to answer and demanded a lawyer. The engineer's lawyer subsequently (and conveniently) said the engineer had lost his memory. 4) And yet the engineer is still employed by Amtrak -- whereas such an evasive response should have been cause for instant dismissal. After all, the engineer remembered enough to demand a lawyer instead of saying "the brakes didn't work" or "the speed control failed". 5) The Democratic Party's response, however, is similar to Argentina's disfunctional politics. It is our US government that is falling apart. 6) The Democrats instantly began pushing the false meme that the fault laid with railroad track, not the engineer. Partly to exploit a disaster to push a political agenda of more government spending -- and partly because the idea of people being responsible for their behavior is foreign to Democrats. 7) The Democratic New York Times, for example, deleted a post of mine in which I pointed out that the engineer responsible for the Dec 2013 train wreck in New York City, William Rockefeller, has not been charged with a criminal offense. Even thought Rockefeller had killed several people by driving his train into a 30 MPH curve at 82 miles per hour. Note that driving a train is not a highly skilled job like flying an airplane. It doesn't appear to be even as difficult as driving a car in urban traffic -- you don't have other trains traveling beside you, constantly cutting in front of you and throwing on the brakes without warning. You don't have to steer left or right --the railroad switches handle that. You just have to adjust the speed --simple. And yet people have died in several recent wrecks because engineers were too irresponsible to handle that simple task. Which is why we need to start sending railroad engineers to jail for manslaughter when these type of wrecks occur. Nope doing 100+MPH in a 50 MPH zone. and Amtrack is SUPPOSED to run on freight lines. You are being duped. The Democrats get a lot of their votes and cash donations from labor unions. In return they give a lot of taxpayer money to projects that employ union members. So no matter what happens to cause a crisis no good crisis will be wasted and all the Democrat politicians will call for more money to be spent on "infrastructure". This is politics pure and simple. This train crash had nothing to do with infrastructure, The train was traveling at over 100MPH in a 50MPH zone. The claim that this was infrastructure related is a leftist agenda argument for further funding of a failed government railroad. In this case, there was no infrastructure problem. There was a governor device on the train to slow it down, but it was turned off and the train driver sped the train about double what it was supposed to go. His lawyers claim he doesn't remember. Maybe he was on drugs - maybe homicide. We'll know soon enough. Don Williams: "Dems" are not solely responsible for all of the USA's woes. In fact it's the right that refuses to upgrade the USA's train system because any major government projects are immediately labeled "socialist" by dinguses like yourself. a) Strange -- usually, people here are labeling ME as the Socialist or Commie, not right wing. b) I worked as a volunteer in Howard Dean's 2004 campaign, in three Democratic campaigns in 2002-2008 and in Obama's 2008 campaign. I left the Party after the 2009-2010 Congress' showed what a fraud it is. I have repeatedly noted here that government can be a force for good and protect the common citizens against the predatory acts of the Rich. But incompetent and corrupt Democratic government does more undermine that argument than anything the Republicans do.